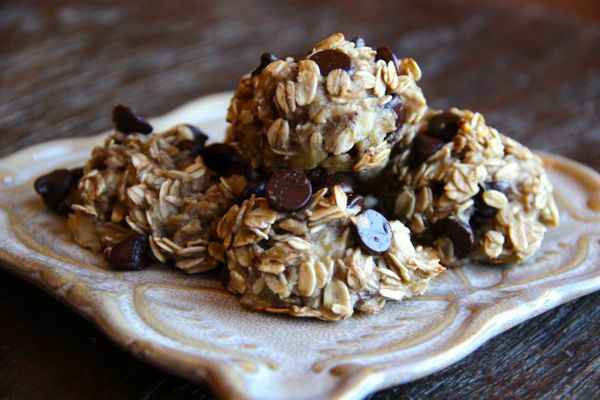 These cookies are healthy, super fast to make and enjoyed by the whole family. Every now and then, I just want to reach for something sweet but do not want the calories and/or fat that most sweet items have. Enter what has been nicknamed on the internet as “the skinny cookie”. Some have walnuts, some have peanut butter and others have applesauce. I have tried most variations and have never been very impressed and then the simplest of the recipes popped up and they are now my “go-to” sweet treat. I have tried adding cinnamon and other slight modifications to adapt them but bottom line is the 3 ingredients work as is. I find these are best eaten the day of baking. The banana flavor intensifies after a day. Also, some reviews state the texture is off. These will not taste like a regular cookie texture-wise but they hit the spot in terms of wanting something sweet and if my kids gobble them up quickly – the texture must be aok! Change them up a bit too if you would like – a raisin/cinnamon combination sounds yummy. Preheat the oven to 350 degrees and lightly spray a cookie sheet with nonstick cooking spray or better yet, simply line a cookie sheet with parchment paper. Mash the bananas in a medium sized bowl with the flat end of a fork. Add oats and mix well, fold in the chocolate chips. Spoon or scoop the dough using a small cookie scoop onto the prepared cookie sheet.